North Korean television aired footage of late leader Kim Jong Il's funeral procession for three hours on Wednesday. Every detail was highly choreographed. Kim Jong Il's coffin is draped in the Worker's Party flag. It sits on a bed of white flowers... presumed to be magnolias, the national blossom. You can see his son and successor, Kim Jong Un, at the front of the car. His uncle, Jang Song-Thaek, is walking right behind him. Analysts say Jang will serve as the power-behind-the-throne as the young Kim takes control. Over on the other side of the car is the country's military chief. North Korea has one of the largest armies in the world. Soldiers dressed in green stretched as far as the eye could see. Many cried openly, with hats in hand, referring to Kim as their general. As the procession drove by, some soldiers seemingly tried to push through their formation to get closer. Guards with guns had to told them back. Most of the cars in the procession looked like Mercedes and Volkswagens. 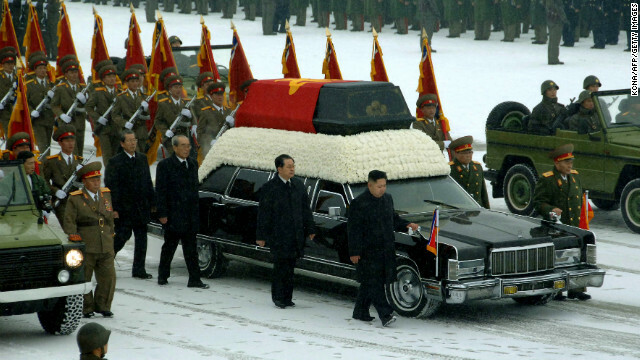 But the car carrying Kim Jong Il's coffin appears to be an American-made Lincoln. The route seemed to follow the one taken in 1994 for Kim Il Sung's funeral. It started and ended at the Kumsusan Memorial Palace. Kim's body will remain on display there, just like his father's.